@Cammie, Yes you can protect content based on member id instead of membership level. There is even an option to set an after login redirect page on a per member bases. This way you can redirect them straight to their content once they login. Hi, I have clients that I need to only have access to their information I post for them. I want to know if I can restrict access to pages based on a member and not a membership level? The content is member based as they are documents and images for that client only. @Jordan, Yes you can do that by using a subscription payment model with this plugin. You will create a PayPal subscription button that will have a 28 days free trial and then it will charge 9.99 per month. When visitors want to become a member, they will have to go through the transaction process (it won’t charge anything for the 1st 28 days). You can add these free trial members to a membership level that has limited permission to view content. After 28 days, you will use the auto upgrade feature to automatically upgrade their account to a membership level with full permission. If they cancel the subscription, the account will be deactivated. I want to create a website where users can sign up for a free 28 days period but you have to provide your card credentials on registration, they will be able to view limited content. Then after a 28 days, it automatically takes monthly payments of 9.99. in which they can view all content. @Casey, Yes there is an option to limit simultaneous log-ins. will emember limit simultaneous log-in per user, so someone can’t share their membership with a group of friends and be logged-in at same time? Hello, I need a certain role that can only see a bbpress forum content, the plugins wp emember create a new user role or create a new capabilities directly to the user? After installing wp_eMemeber plugin, I do not get the member-login. join-us and registration pages. What can I do? to get them showing up under pages in wp? @Cah, There is already a content protection interface in the post/page editor area. When you are editing a post/page, look for a section called “eMember Protection Options” below your editor and you will see it. I really like this emember plugin and I have used it 2 years later. I just want a suggestion, can you add a shortcode button to the WYSIWYG area. I mean, I do it will facilitate protectionism content manually. Sorry, my grammar is damaged. Hopefully you get my drift. @Bente, If you are using the manually approve membership feature then the account is not active until you (the admin) set the status of the account to active. The subscription start date value is set to the date the member pays/registers for the account. We’re using the WP eMembers plug in and it’s working great! But we do have one question: For “Members” and “Manage Members” there’s a headline called “Subscription Starts”. What does this mean? It should be obvious, but it’s not. For some members that are still pending (we haven’t approved them yet), when looking at the date for “Subscription Starts”, it looks like they’re already approved because the date is yesterday or earlier. Can you explain this? @James, You can create products that have a product and membership level. Example: The customer purchases your eBook they also get access to the gold membership level (this can be whatever membership level you want it to be). Note your product can also be multiple items. 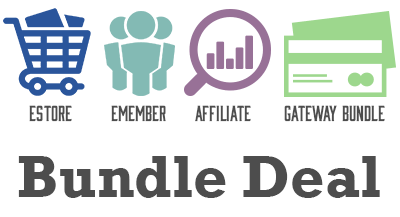 Example: You can have a bundle product such as an eBook, MP3, video and a membership level. The membership can be added to any product. I recently purchased eStore and have had great success with it! I’m thinking of purchasing emember, but I have a quick question. Is it possible to create a bundled deal using emember and estore? For example, can I sell a digital product and at the same time direct people to a “create a user account” page to give these purchasers access to paid material? I would only like to give people who have paid the option to create an account. Thanks! @Bente, The plugin has a manual member approval feature that you can use. When this feature is enabled, it allows you (the admin) to check every membership signup requests and approve or deny it. I’m considering using this plugin and have a question. Is there a way to accept or deny people who try to sign up as members (ie. by receiving an email)? Most of my site is open for everyone, but I do have content that not everyone visiting the site should be able to access. @Tejas, The plugin does track the IP address of all your members who logs into your site. You can set it to block a user’s account if the same login credential is used from more than X number of IP addresses. Also, this plugin has a feature whereby you can disable simultaneous logins so one set of login credentials can’t be used to log into the site at the same time from different computers. One important question to ask. Lately, members share their login info on forums (via PMs) and I stand to lose revenue. Is it possible your plugin could track the Member’s IP? Not full, but only the first half, say 192.168. so as to allow for DHCP address change? Love your products! So easy to use; relatively easy to troubleshoot. Just perfect! clearest and well-thought-out I’ve ever seen. I wish some other “instructional” videos were as good. Great plugin, I had my membership site up and running in a short amount of time. I love that this plugin works out the box. @Andrew, Yes you can add custom fields to the registration page and profile page. You can also edit what can be seen on the profile page by other members. Can I customize the registration and profile page? Can I protect different areas of the same post/page for different membership levels so that the more you pay the more content you get from the same post/page? @Joy, Yes you can do this when using the eMember and eStore. Can I make it so my members can see their purchase history with download links? @Bill, I believe the following option is what you are looking for. We handle drip content a little differently however this will allow you to drip content as you need to. can I use this to drip feed content every 2 weeks for a period of time? 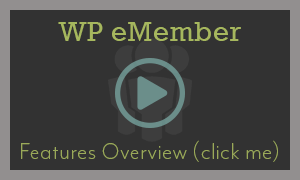 Have spent weeks comparing WP Membership plugins, and the additional plugins for eStore and Affiliate Platform were the pushing points for me getting eMember. I’m really excited to get this new site up… I’ll be selling my training manuals in eStore, and have Free, Silver and Gold membership levels as well as a full blown affiliate program to promote the books and sell my current PLR books… all for under 200 bucks… how can anyone beat that? Love the versatility that these 3 plugins will provide. Content protection was another major PLUS in my decision. @Kabir, Yes you can create upgrade buttons for your memberships. This will allow the member to upgrade their membership whenever they want to. Is it possible that members can upgrade their membership lavel by themself? Very nice and complete membership plugin. Thanks for that. @Ron, Yes there is a download now button with stamping options. 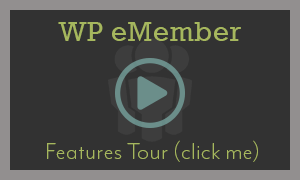 You would need the following plugins to do this Wp eStore, WP eMember and WP PDF Stamper. When using the eStore, eMember and PDF Stamper can I make it so when a member download a PDF file from my site it will stamp their information in it? Can I protect a page on my site so only a specific member can see that content? I sell a design service and I would like it so the customer can log in and view the designs. So I need it so a customer only has access to their designs. @ Francis, Yes you can manually add the membership via the admin. As for the password you can make these whatever you want. However the usernames must be unique. You can however allow more than one person to log-in with the same account. My client runs a training centre and they want a Students Area for different classes but the students will all be registered by the Admin and so there will not be an individual sign-up process – so in other words can ‘Members’ be registered manually via the Admin. area AND can there be one password per Class? @Chris, Yes you can specify a after login re-direction page on a per member basis. I’m developing a backend area for my clients so that they will be able to check invoices and project statuses. Now I see the whole protection of a section page and what not and that may do what I want it to do. Is there anyway that I could set it up to where after each member signs in, the page redirects to their own personal member account page? @Greg, I believe this maybe what you are looking for. Can this plugin control the navigation menu of a site? For example, menu items will only appear for certain membership levels? @Marissa, Yes you can use the section protection option for this. The following post will explain how to do this. Section protection is a powerful tool that allows you the flexibility to protect your pages and posts any way you want to. Can I protect just the download buttons on a page. This way only members can download the digital content? Thank you for saying thanks =) I am glad we could work this out for you. Just a note to thank Ruhul and Ivy for all their help in straightening out my issues with the eStore/Paypal/MailChimp integration. Got in over my head and they responded quickly.